Apologies for the lack of illustration news recently but I have been trying my hand at novel writing. The second draft of my new book is now finished and I am taking a short break to assist the editing process. In the meantime we hope to have some exciting "Open Wide..." news for you soon. Ibex Illustrations is excited to announce that it is now a contributor of clip art to Adobe Stock. It's that time of year when we at Ibex illustrations get excited about The Tour de Yorkshire coming to our doorstep and we have updated the popular cyclist clip art to incorporate the blue winner's jersey as well as the rainbow jersey that will be worn in Yorkshire when the World Chapionships comes to visit in 2019. 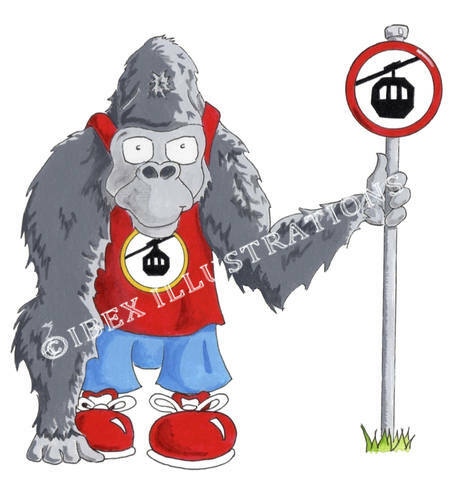 We are in the process of updating our Clip Art page to incorporate the new illustrations that have been added to Shutterstock recently. Congratulations to the 6 winners and well done and thank you to everyone who took part in the #Hoops4Health art competition. We are loving your mouth monsters. The competition was organised by the Newcastle Eagles Basketball Team's Hoops4Health project together with Northumbria NHS Trust and in conjunction with "Open Wide What's Inside?" to promote good dental health to school children in the North East. Amongst other activities the children designed their own mouth monsters. You can see the winning entries here. Our Shutterstock Illustrations are now available to download and use directly from/in the Adobe Photoshop Application thanks to a new plug-in. A big thank you to everyone who donated toothbrushes and toothpaste over the summer to enable Alex, author of "Open Wide, What's Inside?" to give oral health goodies to Project Gambia. A busy few months at Ibex Illustrations: The illustrations are now complete for Book 8 in James Minter's, the Billy Books series, "Billy Knows a Secret." I've been working on novel of my own, "The PIlot" (more soon) and some behind the scenes work in relation to "Open WIde, What's Inside?" means there is a lot to watch out for in this space. Wrapping up the Illustrations for "Billy Want's It All," Book 7 in James Minter's the Billy Booksseries. Hot on the heels of Book 6, I am starting the illustrations for Book 7 in James Minter's "Billy Growing Up" book series, "Billy Wants it All." Just putting the finishing touches to the illustrations for Book 6 of James Minter's "Billy Growing Up" book series, "Billy Saves The Day." It looks like Ant is in a bit of a hurry in Book 6 of James Minter's Billy Growing Up book series, "Billy Saves the Day." It looks like Khalid has something to sing about in Book 6 of James Minter's Billy Growing Up series, "Billy Saves the Day." I am excited to be under way with the illustrations for Book 6 in the "Billy Growing Up" book series by James Minter called "Billy Saves the Day". Psst! Did you want to know a secret? There is a new illustration for the front cover of Book 8 of James Minter's "Billy Growing Up" book series, "Billy Knows a Secret." 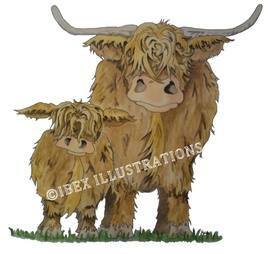 Happy New Year from Ibex Illustrations - We are currently in the process of updating the website. Please bear with us during the process if all links and content are not complete. AUTUMN/WINTER 2015 We have been carrying out a lot of work behind the scenes to have a couple more books ready for you and to create a new look for James Minter's "Billy Growing Up" series. Watch this space for more news. In the meantime, here is a sneak preview of the front cover illustration for Book 7 in the series "Billy Wants It All." The illustrations for the fifth book in author, James Minter's, Life Lessons series - "Max Put Them Back!" are really coming to life. Here is a sneak preview. I am just putting the finishing touches to the illustrations for the fourth book in author, James Minter's Life Lessons Series - "Billy and Ant are Late for School". Check out our "Our Books" section of the website for more information. I am just in the process of putting the final touches to the illustrations for the third book in author, James Minter's Life Lessons book series and am about to embark on the illustrations for book number 4. If you would like to find out more, please visit the "Our Books" section of our website. I am excited to be underway with the illustrations for the third instalment in author, James Minter's, Life Lessons Series, "Billy is Horrible to Ant," which looks at the issue of jealousy. Watch this space or our "Our Books" page for the latest news about this book. We received word from PLR that "Open Wide, What's Inside?" was borrowed over 2000 times in public libraries throughout the UK in the last PLR accounting period. Thank you for all of your continued support. Happy New Year from Ibex Illustrations! 2015 promises to be a very exciting year. We already have a number of projects under way. Watch this space for more news. We start the year with news that our Grand Tour Clip Art is now also available from Shutterstock. We have updated our most popular clip art of the cyclist with the flag in preparation for 2015 and have added two new images to encompass all 3 of the Grand Tours. I have had great fun this week creating more illustrations for the Abergavenny - Gateway to Wales tourist website including this dragon with the Abergavenny coat of arms. We are delighted to be working with the Abergavenny - Gateway to Wales tourist guide website to provide artwork for the site. We are very excited that "Billy's Tenth Birthday" has been incorporated in the Actionwork Theatre Show as part of the UK's Anti-Bullying Week this week. Actionwork are touring over sixty primary schools to deliver their message. I am just putting the finishing touches to the illustrations for the second book in author James Minter's Life Lessons book series. "Billy and Ant Fall Out (Life Lesson - Pride)" is out on 14 December 2014 and is available now to pre-order from Amazon. I will be at the Rose Court Christmas Fair in Leeds again this year and will be happy to sign copies of "Open Wide, What's Inside?" and "Billy's Tenth Birthday" to add to your Christmas stockings. The fair is on Saturday 29 November 2014 from 11am. I am very excitied to have started work on the second book in author, James Minter's Life Learning Series. Watch this space for more information. I am also excited to see the lovely reviews that have been posted on Amazon for the first book in the series, "Billy's Tenth Birthday." If you have enjoyed the book please do tell us and of course all of your friends, family and random strangers. Billy's Tenth Birthday is now available from Amazon in paperback and Kindle version. Our Javelin Thrower Clip Art is now also available from Shutterstock. Yorkshire's Grand Depart was amazing. Can Utrecht live up to such a brilliant event? To pass on the baton we have created some new Utrecht and Netherlands Tour de France Clip Art which is now also available through Shutterstock. Veel Geluck Utrecht! Why not come and have a look at our new book, "Billy's Tenth Birthday," written by award winning author, James Minter. With less than 50 days to go until the arrival of the Tour de France Grand Depart on our doorstep we have added a new image to the Clip Art Gallery to celebrate a very good Yorkshire tradition. We have a very special thank you to say to the Amble and Coquet Children's Centre in Northumberland who have chosen "Open Wide, What's Inside?" to support their dental health campaign. Following on from the Nottinghamshire Public Libraries' support for "Open Wide What's Inside?" 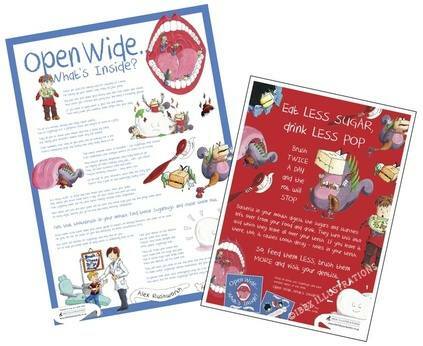 we have a big thank you to say to the Nottinghamshire Education Library Service who have added Open Wide, What's Inside? to their collection. We are very excited that Ibex Illustrations has been accepted as a contributor to Shutterstock, a leading global provider of stock photos, vector graphics and illustrations in more than 150 countries. Ibex Illustrations is delighted to be teaming up with AMP-Merchandise to bring you a comprehensive merchandising solution. AMP-Merchandise specialise in screen printing and direct-to-garment printing. Why not attach your illustration to T-shirts, hoodies, bags, sweaters, flags, and more. You can also set up your own webstore through AMP-Merchandise to sell your finished items. AMP-Merchandise is also offering a 10% extra free offer to Ibex customers. Just quote 'IBEX' when you place your order with AMP. We want to say a really big thank you to The Grammar School at Leeds for choosing Ibex Illustrations, again, to create a logo for the school's cricket squads. 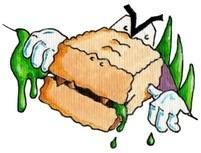 We have added some new Clip Art to the Clip Art Gallery... quite literally! 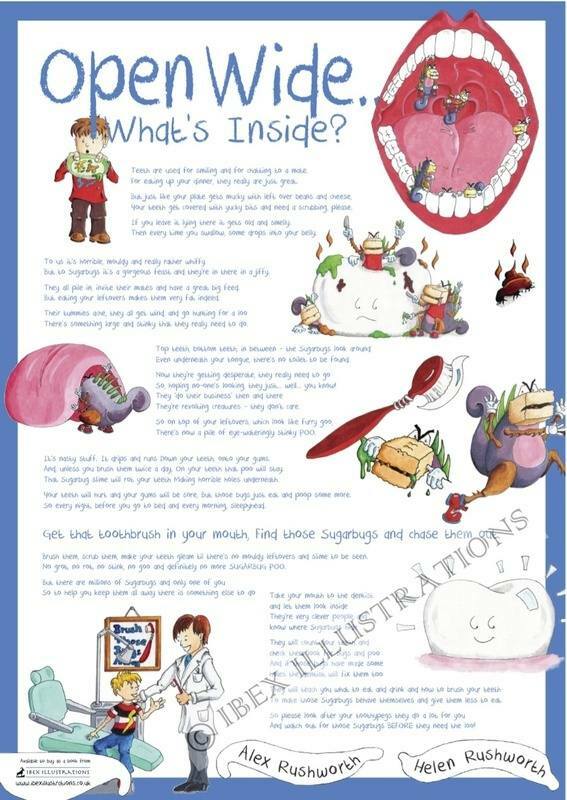 We have added a new facts sheet to our Open Wide, What's Inside? Resources Page on the number of teeth we have and when we get them. In January we will be adding new Resources to the Open Wide, What's Inside? Resources Page. These are in PDF format and free for you to download. Why not check it out? Today we have added a new colouring and question sheet and a maze together with their answer sheets. Happy New Year from Ibex Illustrations! We would like to say a big thank you to both the Henry Bloom Noble Library in Douglas and the Ward Library in Peel for their support of "Open Wide, What's Inside?" Hopefully there will be some big Open Wide smiles breaking out across the Isle of Man very soon. We would like to say a big thank you to East Sussex and Herfordshire Libraries for confirming that they are buying copies of "Open Wide, What's Inside?" for their libraries and Caring for Children collection. A big thank you to The Little Pages for posting our blog "Banish Sugarbugs with a Traditional Advent Calendar" on their website. We are really grateful for their continued support of "Open Wide, What's Inside?" This snail and this whale have been created for one of our new "Open Wide, What's Inside?" resources but are also available now through our Clip Art Gallery. A big thank you to Tower Hamlet Libraries who have ordered copies of "Open Wide, What's Inside?" for their readers. THANK YOU. We have added a new Open Wide Resources Page to the "Open Wide, What's Inside?" section of this website. The idea is to grow a database of resources that will be free to download to all schools, nurseries, libraires, parents etc to help them spread the message of good dental hygiene in children. 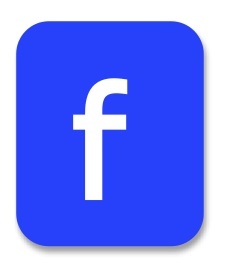 Watch this space as we hope to add additional material to this page shortly. We have more thank yous this afternoon to libraries. We would like to say thank you to Redbridge Libraries and Croydon Libraries who have confirmed this afternoon that they have ordered copies of "Open Wide, What's Inside?" for their readers. Thank you. We would also like to say thank you today to Edinburgh, The City of Westminster and Kensington and Chelsea Libraries for ordering copies of "Open Wide, What's Inside?" for their readers. Thank you. A big thank you to Hounslow Libraries who have "Open Wide, What's Inside?" on order. Thank you. "Open Wide, What's Inside?" author, Alex Rushworth is now on Twitter at @Sugarbugs if you would like to send her a tweet. We are very excitied to see our article in the Autumn edition of Yorkshire's brilliant Smalltalk magazine together with a competition to win "Open Wide, What's Inside?". Thank you to everyone at Smalltalk. It looks great. "Open Wide, What's Inside?" has become truely international with its inclusion in the catalogues of major, international booksellers such as The Book Depository who have a global distribution network. Why not check out our "How to buy your copy page" to see all of the new sales outlets for the book. "Open Wide, What's Inside?" 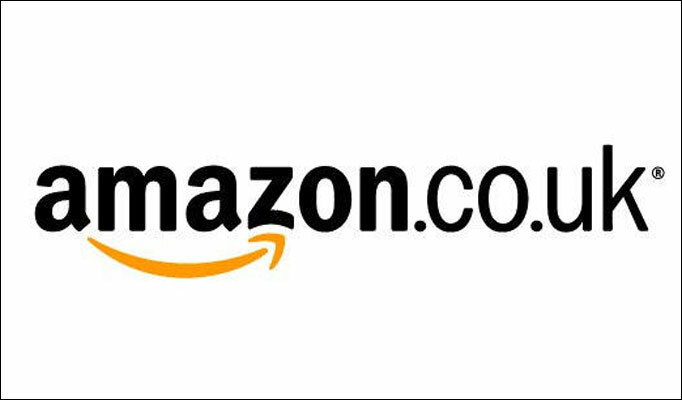 is now available to buy from Wordery.com "the world's fastest growing independent book sellers." A big thank you to North Somerset, Blackpool and Lacashire Libraries for buying copies of "Open Wide, What's Inside?" for their stock. We are very excited that it is going to be available to more readers. The first copies of the book are now starting to arrive on library shelves across the UK so don't forget to reserve your copy. 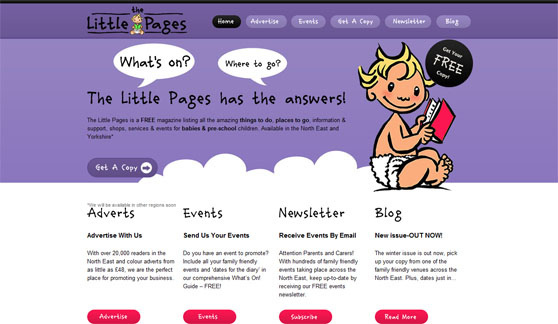 A big thank you to The Little Pages for posting our blog "Children don't know about sweets" on their website. More exciting retail news: "Open Wide, What's Inside?" is now available for sale from WH Smiths' online shop. We are very proud to announce that "Open Wide, What's Inside?" has been listed by Bertrams Books, "the UK's leading book wholesaler, library supplier and publisher distribution business." A great start to Tuesday morning with Wrexham Libraries confirming that they will be ordering copies of Open Wide in their next Children's book order. Thank you Wrexham. An excellent day for our libraries drive with 7 new library authories confirming that they will be stocking "Open Wide, What's Inside?" A big thank you to York City Libraries, North Lincolnshire Libraries, Conwy Libraries, Gwynedd Libraries, Denbighshire Libraries, Wakefield Libraries and Devon Libraries. We have just had a lovley email from Bradford Libraries who have confirmed that they will be ordering copies of "Open Wide, What's Inside?" for their libraries. Thank you Bradford. We have added another piece of sporty clip art to the Clip Art Gallery; this time a javelin thrower. 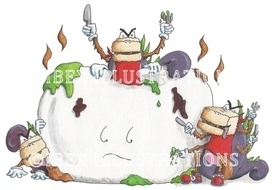 We have added some new sports clip art to the Clip Art Gallery. More kind emails from the libraries: this time we would like to say a big thank you to Manchester City Libraries for agreeing to stock "Open Wide, What's Inside?". Thank you. I know I keep saying it, but we do appreciate all of your support. Another day and more great news from the Libraries. A massive thank you to Hartlepool and Derby City Libraries for their support and confirming that they will be ordering copies of "Open Wide, What's Inside?" for their readers. If these, or any other library on our list, are your local libraries, do go down and reserve the book as a thank you for their stocking the book. We have added new "Roman Soldier" clip art for our Clip Art Gallery. Another big THANK YOU, this time to Liverpool Libraries for confirming that they have ordered copies of "Open Wide, What's Inside?" We really appreciate it. A big THANK YOU to Nottinghamshire Libraries for letting us know that they are ordering copies of "Open Wide, What's Inside?" for the library service. We are very excited that North Yorkshire, Orkney and East Lothian Libraries have also confirmed that they will be stocking "Open Wide, What's Inside?". THANK YOU. A big thank you to Darlington, Cumbria, Middlesbrough and Leeds libraries for letting us know, this morning, that they will be ordering copies of "Open Wide, What's Inside?" for their libraries. We really appreciate it. A brilliant first day talking to libraries. Thank you to everyone we spoke to today for all your help and especially a big thank you to Gateshead and Northumberland libraries who have already confirmed that they will be ording copies of "Open Wide, What's Inside?" for their libraries. We are very excited by the private sales of our book "Open Wide, What's Inside?" and continue to look forward to your purchases. However, the original trigger for Alex writing the book was the appauling statistics in children's dental hygiene in this country and her desire to do something about it. We would therefore really like to reach a wider audience and in the public domain. We are therefore hoping to contact all UK public libraries in the coming weeks to see if we can share "Open Wide..." with more children. If you work for a public library or are responsible for a private library, for example in a school, nursery, hospital etc and are interested please get in touch, we would love to hear from you. RELAUNCH - We are back! Following maternity leave, Ibex Illustrations is back in business. Our Books - "G.C.S.E. Languages - Yours for the Taking"
New products in our On-line shop. From Easter 2013 I will be taking maternity leave. However, do not worry, the shop will continue to operate as usual. "Open Wide, What's Inside?" author, Alex Rushworth has kindly offered to process shop orders in my absence. Please remember that Alex is also a full time dentist but orders will still be processed as efficiently as possible. If you have any queries relating to "Open Wide, What's Inside?" or the shop please contact Alex directly at [email protected]. 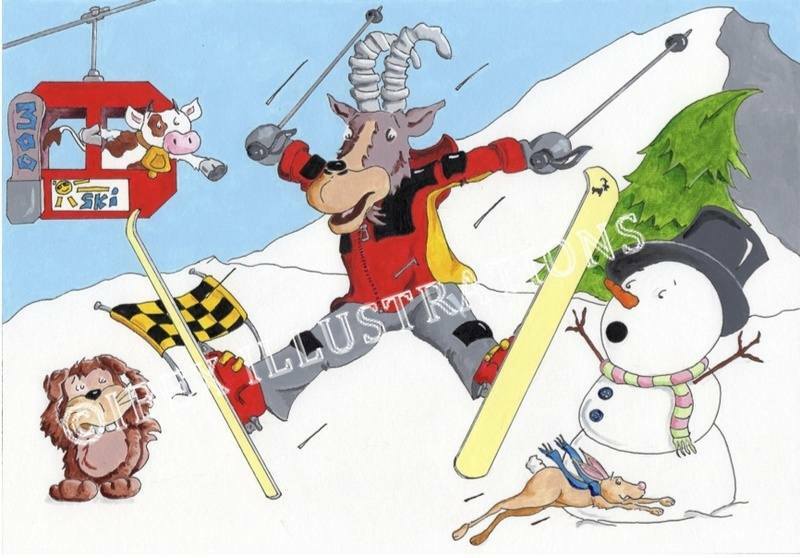 If you have any queries relating to other Ibex Illustrations business, for example bespoke illustrations, please do still contact me at [email protected] as I will still be checking my emails from time to time. 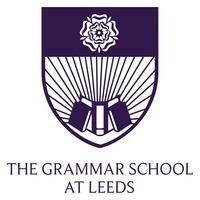 Good Luck to the boys of the Grammar School at Leeds on their cricket tour of Dubai. 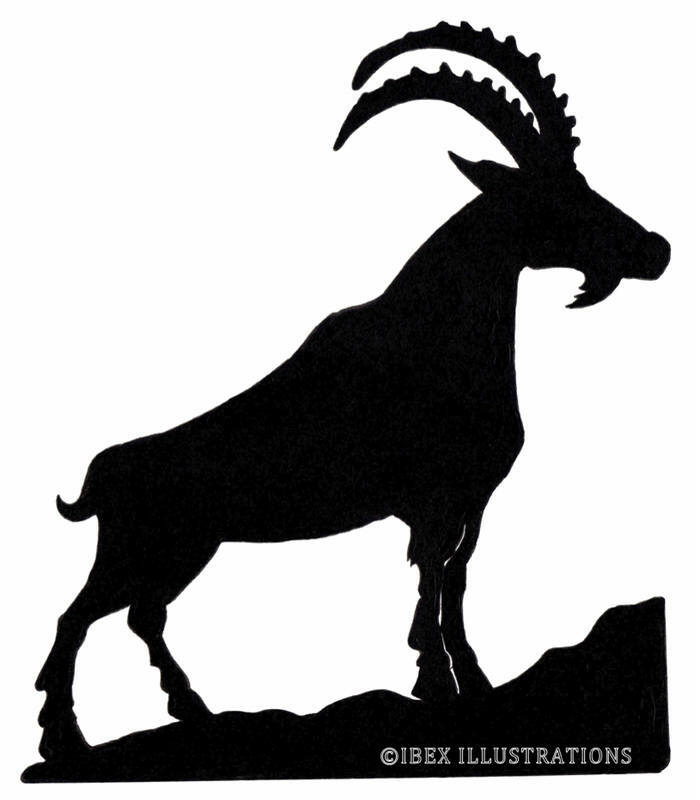 I hope your Ibex Illustrations logo brings you good fortune. A big thank you to Voices of Experience for choosing Ibex Illustrations to create fun characters to appear in their logo and letterhead. Why not take a sneak peak at the images in our portfolio. Posters now in stock: Due to more excellent service from Elanders, the red A3, 'Eat Less Sugar...' posters are in stock ahead of schedule and ready for you to buy. 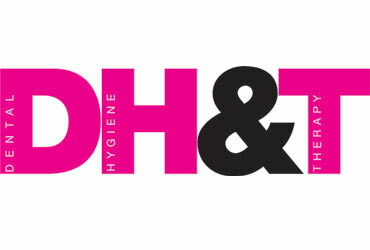 Just got our copies of the February 2013 edition of Dental Hygiene & Therapy Magazine featuring the article "Let's Talk 'Poo'" all about "Open Wide, What's Inside?" "Open Wide, What's Inside?" can now also be ordered through Amazon. If you have liked the book and would like to leave a review, please do. We would really appreciated it. 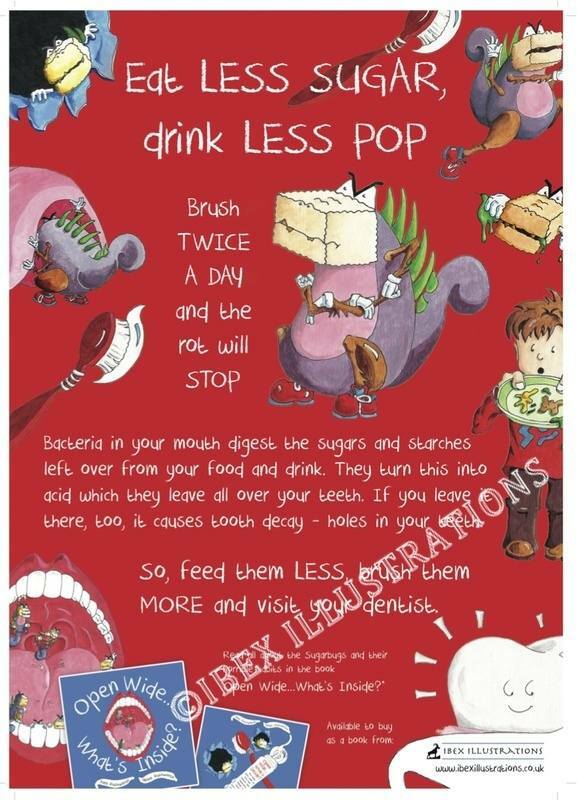 We have received word from our printers that the A3 "Eat Less Sugar..." poster should be available to buy from our shop from Monday 11 March 2013. The shop is now ready and we are happy to take orders for this poster. We will let you know as soon as they arrive and pop them in the post for you. The Ibex Illustrations shop has now been updated in anticipation of the arrival of the first "Open Wide, What's Inside?" posters for sale. The A3 "Eat Less Sugar..." poster should be available later this month. NEW POSTERS COMING SOON! - We will soon be introducing "Open Wide, What's Inside?" posters for sale from our online shop. Watch this space for more information about when these will be available and more details about the posters themselves. NEW STOCK NOW IN! Following the publication of the Telegraph Article the book 'Open Wide, What's Inside?' flew off the shelves but we have now replensihed our stocks and are looking forward to your Orders. Any reserved copies will be posted out to you in tomorrow's (Thursday 14) post. Thank you for you for all your Orders. 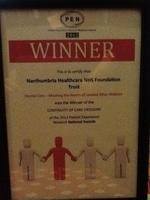 Congratulations to "Open Wide.." author, Alex Rushworth, and the rest of the "Northumbria Healthcare NHS Foundation Trust - Dental Care - Meeting the Needs of Looked After Children" Team for winning the Continuity of Care Award at the 2012 Patient Experience Network National Awards last night. Look out for an article by 'Open Wide, What's Inside?' 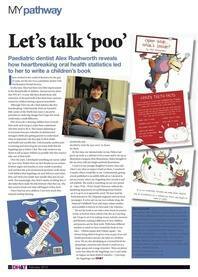 author, Alex Rushworth in the next edition of Dental Hygeine & Therapy Magazine. Look out for a feature by 'Open Wide, What's Inside?' author Alex Rushworth in the next edition of The Little Pages. We are very excited to announce that the National Childbirth Trust has included our book 'Open Wide, What's Inside?' in its new catalogue. Thank you to the Grammar School at Leeds for choosing Ibex Illustrations to create the logo for the school's cricket tour to Dubai later this year. Take a look at our Portfolio page for a sneak peak of the image. Good luck to all the boys on the tour! 'Open Wide, What's Inside?' will soon be available to borrow from Newcastle City Libraries. 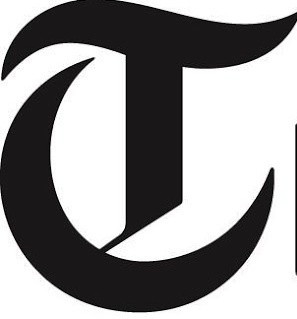 Thank you to Daisy Bridgewater for her excellent article in the Telegraph Magazine : "The Whole Tooth: how to keep their pearly whites pearly and white" which featured our book "Open Wide, What's Inside?" "Open Wide, What's Insde?" 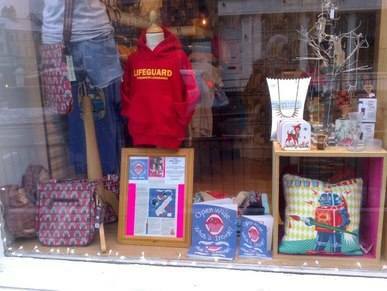 is now also available to buy from Falmingo and Finch shop in Tynemouth. All orders placed in the Ibex Illustrations shop between Saturday 19 and Monday 21, which were delayed by the snow, are now in the post and on their way to you.